Stay informed of the latest progress in canine health research. We need your support to fund research that helps dogs live longer, healthier lives. As part of the AKC Canine Health Foundation's ongoing Bloat Initiative, on October 3, 2013 funding was awarded for two significant research projects concerning the cause of Gastric dilatiation-volvulus (GDV) or bloat. 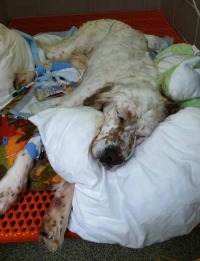 Honey is an English Setter treated for bloat by Dr. Elizabeth Rozanski. Dr. Nelson’s grant was responsive to our RFP ‘special topic of interest’ request: Characterization of pathways mediating gastrointestinal motility changes associated with GDV, including utilization of intraluminal sensors and non-invasive sensing technologies to monitor/measure motility in vivo. Abstract: Gastric dilatation-volvulus (GDV or “bloat”) is a devastating disease common in large and giant-breed dogs. Occurring most frequently in older dogs with a close relative who has also suffered the condition, the stomach becomes both displaced and distended with air. Without emergency medical stabilization and surgical intervention, affected dogs quickly experience shock, damage to the stomach wall, and death. Most of the research relating to GDV has described risk factors for the disease, determinants of outcome with treatment, and the effectiveness of preventive surgery (gastropexy). However, the underlying cause of GDV remains unknown. Abnormalities in the ability of the stomach to contract have been documented in dogs after naturally-occurring GDV. An analogous stomach condition in cattle, left-sided displacement of the abomasum (LDA) has been shown to, in some instances, be associated with abnormalities in the motilin gene. Motilin is an important driver of stomach contraction. This suggests that LDA and potentially GDV may be primarily caused by a stomach that does not properly contract, and that this condition may be inherited. The goals of Dr. Nelson’s study are to determine the relationship of abnormal stomach contraction with GDV and to define the biochemical and genetic alterations that may be associated with these stomach abnormalities. In the long term, they hope to develop a test to identify dogs at high risk for GDV that would allow selective breeding to eliminate the condition and to determine which dogs will benefit most from prophylactic gastropexy or other preventive therapies. 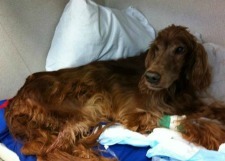 Irish Setter being treated for bloat. Dr. Sharp’s grant was responsive to our RFP ‘special topic of interest’ request: Integration of genomic with epigenomic, transcriptomic, proteomic, metabolomic, and other-omic methodologies to elucidate the effects of genetic risk variants on the pathophysiology of GDV for diagnostic and prognostic use in high-risk breeds. Abstract: Gastric dilatation and volvulus (GDV), or bloat, is a common condition in large and giant breed dogs with an unacceptably high morbidity and mortality rate. Due to the importance of GDV in many dog breeds, several previous studies have investigated potential risk factors for the development of GDV. It is known that there is no single cause for GDV, rather its occurrence is multifactorial, with both genetic and environmental factors contributing. Dr. Sharp proposes to further investigate how these risk factors cause GDV through the application of genomic and molecular methods. She will do this by analyzing samples from purebred dogs with GDV and comparing them to dogs of similar age and breed that have not developed GDV. She will perform a genome wide association study (GWAS) to identify differences in the genetic makeup of dogs with GDV, and see which genes are turned on and off in GDV (epigenomics). She will also determine if dogs with GDV have different types or amounts of proteins, hormones and other molecules in their blood and tissues (transcriptomics, proteomics and metabolomics). She and collaborators hypothesize that only when we put all of this information together (genomic, epigenomic, transcriptomic, proteomic and metabolomic) will we truly understand what causes GDV. The ultimate aim of understanding what causes GDV is to allow us to best intervene to prevent the disease from occurring. Please support these research efforts with a generous donation!